Hi there and welcome back to another episode of The Art of Business English. Today I have the third instalment on presenting for you all. We are going to be looking at the vocabulary and techniques for closing our presentation and taking questions. If you haven’t already checked out the previous two episodes, 39 and 40 on presenting then go and take a look. They will help you to get a complete picture of the presentation development process. If you recall our three-step process from the previous episodes you will remember that we preview, give and review at all stages of our presentation. So, now I want to explain an important step for the closing. During our presentation we will have discussed many points, each idea should have had a clear introduction, body with supporting arguments and conclusion. This natural process helps to provide a clear and logical flow to our ideas. Therefore, the conclusion is also incredibly important for bringing all of these ideas back together to reaffirm them. Remember, many people in the audience need to have the main ideas repeated back to them in a summarised format in order to fully remember all the information that they have been exposed to. Golden rule, the fastest way to lose your audience’s attention and break the unifying thread (hilo conductor) is to not bring all the ideas together at the end into a clear summary. This is especially important when we are using a story-telling presentation format. So, it is safe to say that the end of your presentation is just as important as all the other parts that come before it. People will often only remember what you said at the beginning and end of your presentation and they may lose focus during the body. Therefore, you should end with a powerful call-to-action or convincing argument if you want to be sure you will get people to adopt your idea or plan. You should recall from the previous episode that we need to move people away from pain and towards comfort. So, your CTA should paint a picture of comfortable bliss when your idea has been adopted. You should try and define future rewards which compel people to adopt your ideas. If you just list the ideas or next steps at the end of your presentation, but fail to attach a future reward to them, then you stand less chance of having your ideas adopted. So, how can we create this sense of reward that compels people to move away from pain and towards comfort? Firstly, we need to associate a direct benefit to the individual. How can we frame our idea so that it will some way meet the audiences needs, allow them to gain more freedom, influence, status or time? Secondly, we can also try and associate our idea with the immediate circle of our individuals in the audience. What I mean by that is, how can our idea help our audience to impact on their direct reports or bosses, customer, suppliers etc. Finally, how will our ideas benefit the world. How can we impact on the masses, such as improving the environment? Remember, the more benefits we can attach to our ideas and then transmit these benefits to our audience, the better we will be able close our presentation and get things done. Right, so to summarise, when we are closing our presentation with a list of action points we need to try and attach a future reward to the completion of each of these points, by transmitting the benefits to our audience. Finally, before I finish this part of the episode I want to list the other important things that should not be forgotten in your closing. 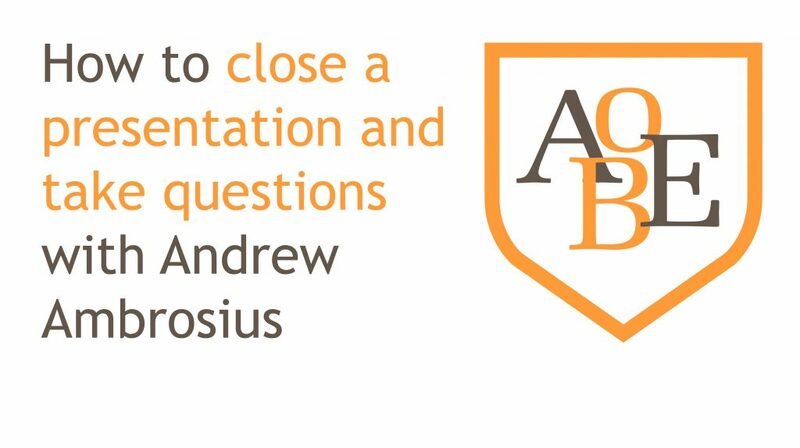 The closing of your presentation in many cases will be an important opportunity for your audience to ask questions and for you to clarify any areas that may not have been clear. So, if you are taking questions, make sure you invite your audience to ask them. Make sure you thank everyone for their time. This is polite and shows respect for other people’s time. Be sure to share your contact information, when appropriate, in case anyone wants to email you with further questions. This is a great way to network and develop your professional network. Now that we understand the importance of the conclusion, let’s take a look at some useful vocabulary and expressions. As with previous episodes, I have broken this section into separate functions with the supporting expression. Closing signals Well, that brings me to the end of my presentation. That concludes my presentation. However, I’d like to quickly summarize the main points or takeaways. Thanking I’d like to thank you all for your attention (formal ending). Thank you all for coming (less formal). Thank you so much for your interest and attention. I can see that our time is just about up so to finish I’d like to say thank you. If anyone has any questions I would be more than happy to answer them. If anyone has any questions, I’d be happy to open up the discussion. Perhaps we could leave it there...? Giving contact info Now, before I leave, here is my email address if anyone would like to contact me to discuss any points further. Well, before I leave, I would like to share my contact details with you all just in case you need further information. So, there we have an overview of some essential language to help you bring your presentation to an end and take questions from your audience. In the last part of the episode we will take a look at an example dialogue for closing our presentation. Here we are going to be using the same scenario from our two previous episodes, with John Briggs wrapping up his presentation on sales data analysis. He will also provide a strong call-to-action to make his closing powerful. That concludes my presentation. However, I’d like to quickly summarize the main point here today. As you can see we have had a strong Christmas period, however we are facing strong headwinds from a very competitive market place. If we are to start the new year with a strong first quarter it will take extra work from all departments to meet our sales objectives, but we can make those numbers a reality with a unified effort. I know we have been working our tails off this Christmas but hang in there. We can pull together and meet our Q1 targets, this will set us up for a strong year, making the rest of the quarters much easier. And remember, the Q1 target rewards are bonuses and extra days off at Easter. I’d like to thank you all for your time today, now if there are any questions. OK, so if that is all, perhaps we can leave it there. Thanks again everyone. So, there is our conclusion with a strong call-to-action. Can you see where the call to action was and where the future benefit/reward was imbedded? Let’s take a second to break it down. We are facing strong headwinds from a very competitive market place. Then we have the strong call-to-action. We use emotive language such as ‘we’, ‘strong’ and ‘unified effort’. If we are to start the new year with a strong first quarter it will take extra work from all departments to meet our sales objectives, but we can make those numbers a reality with a unified effort. Then in the second part we create the new future reward scenario which we hope will motivate our audience to move away from the pain and toward the comfort. We can pull together and meet our Q1 targets, this will set us up for a strong year, making the rest of the quarters much easier. Then finally, we attach a clear benefit for our audience. It’s the last point we make so that it is fresh in the listeners mind. And remember, the Q1 target rewards are bonuses and extra days off at Easter. So, there you have it a powerful closing with a strong CTA and benefit attached future reward. Well, that brings me to the end of another episode, I hope you have enjoyed this lesson on closing presentations with strong CTA´s. Please get in touch with me if you are interested in developing your presentation skills further as we offer great online coaching programs which are developed specifically to meet your individual needs. If you enjoyed this episode then please feel free to share it with your friends, family or work colleagues. Remember to head over to the AOBE website and sign up for the full transcript and quizzes as well as free weekly coaching. Until next week take care and good luck with your presentations.